The SmartCanucks SmartSource printable coupon portal has a new coupon available for Persil products. 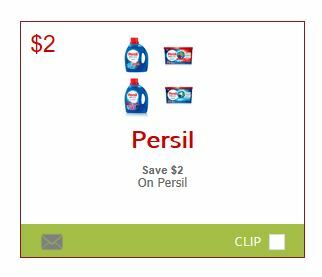 Click the link below and you will find this coupon for $2 off the purchase of any Persil product. There is a great offer that you can use this coupon with. Currently, if you buy two participating household products including Persil you will receive the third free. So long as you have multiple items on your receipt and you cannot tell what the coupons are for, you would likely be reimbursed for the third product at the purchase price before coupons. This week the 48 load container of Persil is on rollback at Walmart Canada for $8.97, If you were to use a coupon on each of the three products and get reimbursed for the third, your final cost per jug would be $3.98, and actually even less because the amount you are reimbirsed through Paypal is in American funds. Click here to print your coupon for $2 off the purchase of Persil. Click here for the buy two, get the third free offer. Has anyone been able to print this? I get the following error message: Unknown application error, unable to proceed, please try after some time.